AIR RIDE/AIR LIFT: Provides a smooth ride and maximum cargo protection. 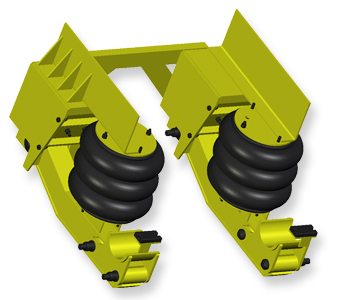 Airsprings within hangers lift axle when not in use. MAXIMUM LIFT: Up to 11 inches. Provides plenty of lift, even on low truck frames. fAXLE TRAVEL: 14 inches total, lift and rebound. LOW MAINTENANCE: Durable urethane bushings at all pivot points. 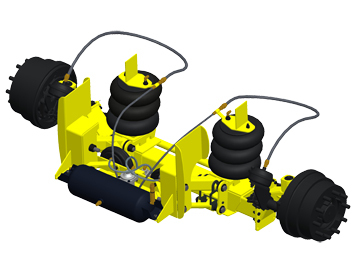 SELF-STEERING AXLE: Offers longer tire life and better vehicle handling. Features leading kingpin for optimum performance. Airsprings lift axle when not in use. MAXIMUM LIFT: Up to 10 inches. LOW MAINTENANCE: Durable bushings at all pivot points. No lubrication required. 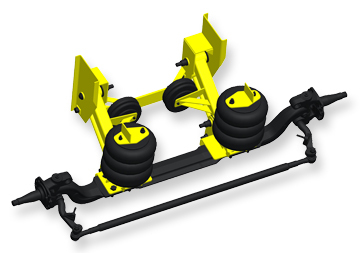 ADJUSTABLE AXLE: Fabrication axle provides a ride height range of 6 to 13 inches. PARALLELOGRAM DESIGN: Maintains a constant king-pin angle through the full axle travel. MAXIMUM LIFT: Up to 8 inches. 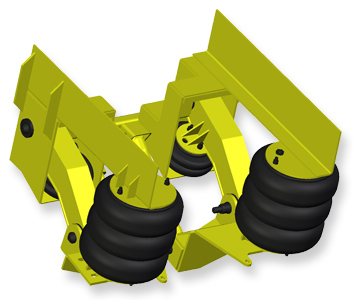 PARALLELOGRAM DESIGN: Maintains a constant kingpin angle through the full axle travel. ADJUSTABLE AXLE: Fabricated axle provides a ride height range of 6-13 inches. 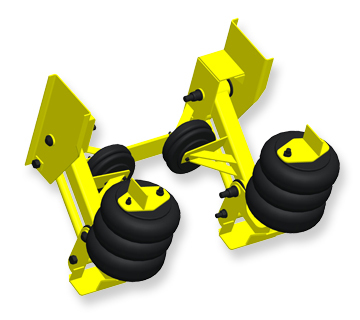 Air springs lift axle when not in use. MAXIMUM LIFT: Up to 6 inches. 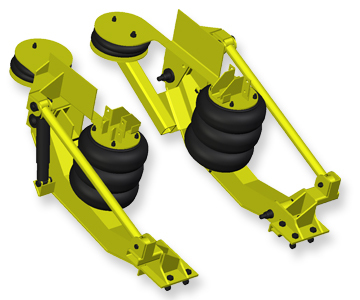 PARALLELOGRAM DESIGN: Maintains a constant kingpin angle through the full axle travel. 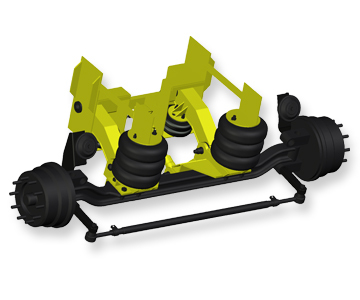 Steerable lift axle for lower frame trucks. LOW MAINTENANCE: Durable bushings at all pivot points. 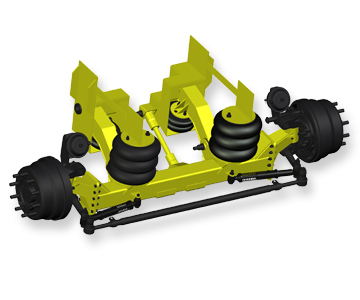 PARALLELOGRAM DESIGN: Maintains a constant kingpin angle through the full axle travel. 8K Fabricated Axle. Utilizes a 6 hole 17.5 wheel & 17.5 tires. 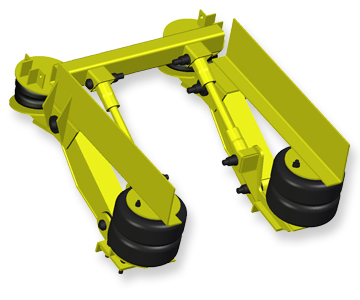 PARALLELOGRAM DESIGN: Maintains a constant kingpin angle through the full axle travel. I-Beam Axle. 3 1/2 and 5 1/2 drop available. 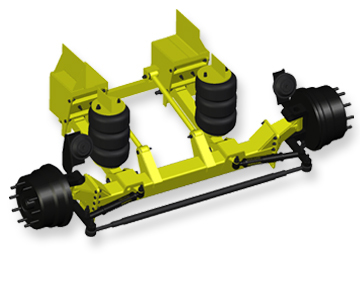 PARALLELOGRAM DESIGN: Maintains a constant kingpin angle through the full axle travel. Fabricated Axle. 1 1/2 to 5 1/2 drop available. MAXIMUM LIFT: Up to 20 inches.